In the last 6 years Omondo has been providing UML tools for Java Developers. Thousands of projects have used EclipseUML successfully. However, many of these projects have only used Omondo at implementation level and have not benefited from the wealth of functions offered by EclipseUML. The main issue today for corporate project development is to decide which level of abstraction to use: either MDA stage with no code generation (Rational) or Implementation stage with live code generation (EclipseUML 2007). Working at MDA level is recommended for requirements modeling but only delivers a blue print to the implementation team. Working at the implementation level is not possible if a higher level of abstraction is required. 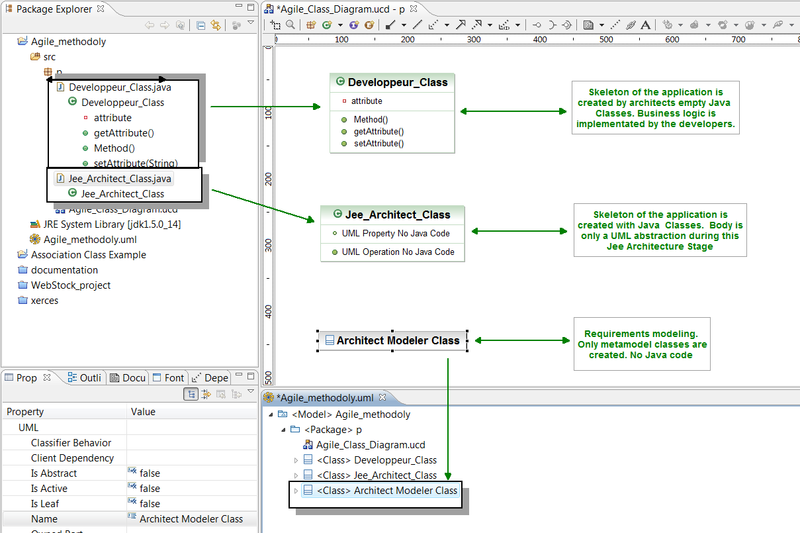 The solution is to mix both MDA and Implementation modeling using EclipseUML 2008 (below is a class diagram example of the recommended development cycle). EclipseUML 2008 allows Architects to model at a higher level of abstraction and Developers to implement business logic inside the same tool. EclipseUML 2008 is the only tool designed to help organizations adopt a strategy for integrating all components of the development cycle. With this tool, you will be in position to respond more quickly, with more thorough analysis of the options than organizations that do not cover the full development cycle.